Rhymes (and dogs) the way they should be: rumbustious and funny and fantastic. Beware: you’ll laugh yourself silly at just how messy this naughty mutt looks. Hairy Maclary, the scruffy Skye Terrier, is busy chasing the neighbourhood cats around town. He feels bumptious and bustly, bossy and bouncy and frisky and hustly. He feels great, in fact! Until he comes face to face with Scarface Claw, the toughest tomcat in town. 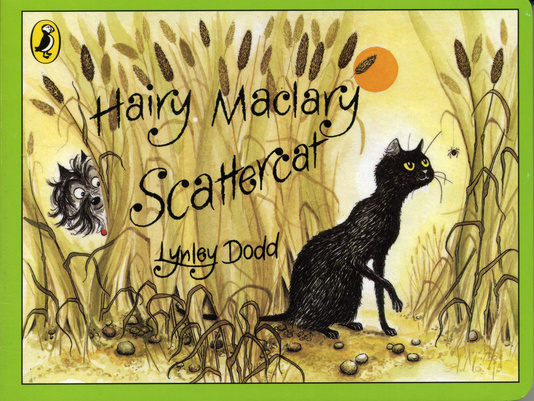 Now it’s Hairy Maclary’s turn to be bustled, rustled and hustled. Tee hee! 700L Lexiles are the global standard in reading assessment. They are unique as they are able to measure a child and a book on the same scale – ensuring the right book gets to the right child at the right time. great pictures you will love this book if you love animals.